Background Broad indications for the use of statin medications are resulting in more patients using these therapies. Simultaneously, healthcare professionals are strongly advocating recommendations to increase exercise training (ET) as a means of decreasing cardiovascular disease (CVD) risk and improving other parameters of fitness. Methods We review the literature to explore mechanisms that may increase the risk of statin/ET interactions, examine the benefits and risks of combining ET and statin use, and offer strategies to minimize the hazards of this combination therapy. Results The combined use of statins and ET can result in health gains and decreased CVD risk; however, multiple factors may increase the risk of adverse events. Some of the events that have been reported with the combination of statins and ET include decreased athletic performance, muscle injury, myalgia, joint problems, decreased muscle strength, and fatigue. The type of statin, the dose, drug interactions, genetic variants, coenzyme Q10 deficiency, vitamin D deficiency, and underlying muscle diseases are among the factors that may predispose patients to intolerance of this combined therapy. Conclusion Effective strategies exist to help patients who may be intolerant of combined statin therapy and ET so they may benefit from this proven therapy. Careful attention to identifying high-risk groups and strategies to prevent or treat side effects that may occur should be employed. Physical activity reduces the risk of cardiovascular disease (CVD), both directly and by reducing other risk factors such as unhealthy lipid profiles, blood pressure, insulin resistance, and obesity.1-4 Statins further reduce the risk of CVD events and all-cause mortality,5 principally by lowering levels of low-density lipoprotein (LDL) cholesterol. Although statins are well tolerated, they can affect skeletal muscle, producing symptoms that range from myalgia to creatine kinase (CK) elevations and rhabdomyolysis. These statin-associated musculoskeletal side effects can be exacerbated by physical activity.6-8 Statin use is becoming more widespread as indications broaden for CVD risk reduction. Simultaneously, physical activity is increasingly recognized and recommended to reduce CVD risk.9 Statin-associated musculoskeletal side effects, exacerbated by recommended physical activity, could lead to reduced statin use in individuals who would benefit from statin therapy. This review explores mechanisms that may increase the risk of statin/exercise training (ET) interactions, examines the risks and benefits of combining physical activity and statin use, and offers strategies to minimize the hazards of this combination therapy. Populations at risk of musculoskeletal side effects from combined ET and statin therapy are the elderly, certain racial groups and genotypes, patients with mitochondrial diseases, and patients with underlying muscle diseases. Vitamin D deficiency is widespread and may also predispose individuals to excess risk. The elderly appear to be at greater risk than the general population for statin-associated myopathies that can occur in up to 11% of patients in the geriatric population.35,18 Statins are commonly indicated medications for the elderly, given the high incidence of medical conditions such as diabetes mellitus, cerebrovascular disease, and CVD in this population. Myopathies related to abnormal genotypes also predispose individuals to statin-associated worsening of symptoms. Of 110 patients with primarily statin-associated myopathies, 11 (10%) had at least one abnormal allele for a gene affecting muscle metabolism.39 These patients may have had especially severe myopathy because many were willing to undergo skeletal muscle biopsy. Only 3% of asymptomatic patients on therapy tested positive for the abnormal alleles. The various genes involved those coding for carnitine palmitoyltransferase II deficiency, McArdle disease, and myoadenylate deaminase deficiency. In another study, a genomewide scan conducted in 85 subjects with statin-associated myopathy yielded a single strong association of myopathy with the rs4363657 single-nucleotide polymorphism located within SLCO1B1.2 The prevalence of the variant in this population was 15%. SLCO1B1 encodes the organic anion transporting polypeptide OATP1B1, thereby regulating the hepatic uptake of statins. The majority of myopathies associated with 80 mg simvastatin were attributed to the 521C variant of SLCO1B1.2,40 Additional studies have shown that other polymorphisms of the SLCO1B1 gene result in elevated statin levels.41,42 The theory is that reduced hepatic uptake of statins in individuals with an abnormality in SLCO1B1 allows higher statin levels in the periphery, including skeletal muscle. Much more likely to occur than rhabdomyolysis among statin users are symptoms related to myalgia. Of 354 patients who self-reported muscle problems related to statins, 300 (85%) patients met formal criteria for probable or definite medication-adverse-effect (MAE) causality;56 93% of patients reported muscle pain, 88% reported fatigue, and 85% reported weakness. Atorvastatin users experienced more MAEs than lovastatin users. Higher potency statins caused MAEs in 100% of 39 rechallenges vs a 73% recurrence rate when lower potency statins were administered in the rechallenge. The MAEs also affected quality-of-life and functional domains in the survey. Cell culture experiments have indicated that certain statins appear to be much more intrinsically toxic to myocytes than others. Compared to both simvastatin and lovastatin, pravastatin was >100 times less toxic in decreasing rat myotubule protein synthesis.79 Avoiding harmful statin drug interactions should decrease the potential for elevated statin levels. Drugs metabolized by the CYP system, particularly those metabolized by CYP2C9 and CYP3A4, should be prescribed with caution. Successful strategies include not only changing the type of statin but also adjusting the dosage of the drug. Recent studies have indicated that every-other-day statin use may be as effective as daily dosing in CVD risk reduction.80 In a retrospective cohort study of >100,000 statin users, >50% of the patients had discontinued the drug at some time during an 8-year period.81 Nearly 20% of the discontinuations were for statin-associated side effects. However, of the 6,579 patients who were rechallenged with a statin, 90% were able to tolerate some type of statin 1 year later. This study provides evidence that an individual who otherwise needs statin therapy should be considered for reinitiation of a statin even if a discontinuation was previously necessary. Another potential treatment of statin-associated side effects is L-carnitine. Carnitine is required for the transport of fatty acids across the mitochondrial membrane and energy production. Statins decreased carnitine levels in the rabbit model.96 L-carnitine may help with the possible disruption of mitochondrial membranes in patients with statin-associated myalgia. In rats, myotoxic doses of simvastatin resulted in significantly elevated levels of CK.97 This effect was reversed by administration of L-carnitine, and a concurrent improvement in walking ability was observed. Extrapolating carnitine dosing in these animal studies to potentially beneficial human dosing yields a human dose equivalent of 6 g of carnitine twice per day. However, most human studies have used doses of 3-6 g per day. Evidence exists of a high likelihood of underlying carnitine abnormalities or muscle disease carrier states in patients with statin-associated myalgia. These abnormalities include carnitine palmitoyltransferase-2 deficiency, McArdle disease carrier status, and lipid storage problems.98 These data suggest L-carnitine as a potential therapeutic option for further trials. Vitamin D replacement in statin users with vitamin D deficiency may also be a successful therapy.48,99 In a 2009 study, replacing vitamin D and stopping the statin medication reversed myalgia complaints in 6 of 8 patients.48 Six of the patients agreed to retry statin medication while maintaining proper levels of vitamin D, and 4 of those patients tolerated the challenge without recurrence of myalgia for at least 6 months. Statins have been clearly shown to be potentially lifesaving medications and are indicated in many patients to decrease CVD risk. At the same time, caution should be exercised in prescribing statins and ET, particularly in high-risk groups. A cavalier approach to this combined therapy may unnecessarily expose individuals at risk to side effects, resulting in discontinuation of the treatment and subsequent increased risk for CVD events. Careful attention to identifying high-risk groups and strategies to prevent or treat side effects that may occur should be employed. Clinicians have several therapeutic options when treating patients who perform ET and have statin-associated myopathy. Adjusting statin therapy by using the lowest possible dose, utilizing a hydrophilic statin, recommending a drug holiday followed by a rechallenge, or adding ezetimibe to enable LDL lowering on reduced statin dosage may be effective strategies. Although studies have not shown a consistent benefit, use of supplements such as CoQ10, vitamin D, or L-carnitine may be effective. Finally, keen attention should be given to avoid drug interactions known to increase the likelihood of statin myopathy. (12 1, 2009) Exercise protects the cardiovascular system: effects beyond traditional risk factors. J Physiol 587(Pt 23):5551–5558, pmid:19736305, doi: 10.1113/jphysiol.2009.179432. Link E, Parish S, Armitage J (8 21, 2008) SLCO1B1 variants and statin-induced myopathy—a genomewide study. N Engl J Med 359(8):789–799, pmid:18650507, doi: 10.1056/NEJMoa0801936. et al. (11, 2012) Impact of coenzyme Q-10 on parameters of cardiorespiratory fitness and muscle performance in older athletes taking statins. Phys Sportsmed 40(4):88–95, pmid:23306418, doi: 10.3810/psm.2012.11.1991. (Spring 2010) Coenzyme q10 and statin-induced mitochondrial dysfunction. Ochsner J 10(1):16–21, pmid:21603349. Baigent C, Blackwell L, Emberson J (11 13, 2010) Efficacy and safety of more intensive lowering of LDL cholesterol: a meta-analysis of data from 170,000 participants in 26 randomised trials. Lancet 376(9753):1670–1681, pmid:21067804, doi: 10.1016/S0140-6736(10)61350-5. et al. (4 17, 2006) National Lipid Association Statin Safety Task Force Muscle Safety Expert Panel. An assessment of statin safety by muscle experts. Am J Cardiol 97(8A):69C–76C. (10, 1997) Lovastatin increases exercise-induced skeletal muscle injury. Metabolism 46(10):1206–1210, pmid:9322808. (1 15, 2012) Effect of statins on creatine kinase levels before and after a marathon run. Am J Cardiol 109(2):282–287, pmid:22036108, doi: 10.1016/j.amjcard.2011.08.045. (12 17, 2002) Third Report of the National Cholesterol Education Program (NCEP) Expert Panel on Detection, Evaluation, and Treatment of High Blood Cholesterol in Adults (Adult Treatment Panel III. Circulation 106(25):3143–3421, pmid:12485966, ) final report. (2013) AHA/ACC guideline on lifestyle management to reduce cardiovascular risk: a report of the American College of Cardiology/American Heart Association Task Force on Practice Guidelines (American College of Cardiology/American Heart Association Task Force on Practice Guidelines), Circulation. 2014 Jun 24; doi:. Errata in: Circulation. 2015 Jan 27;131(4):e326. Circulation. 2014 Jun 24; 129, 129, 25 Suppl 2, 25 Suppl 2, pp S76–S99, pp S100–S101, 10.1161/01.cir.0000437740.48606.d1. , Health, United States, 2011. http://www.cdc.gov/nchs/data/hus/hus11.pdf. Accessed June 15, 2015. (5 1, 2015) European Atherosclerosis Society Consensus Panel. Statin-associated muscle symptoms: impact on statin therapy—European Atherosclerosis Society Consensus Panel Statement on Assessment, Aetiology and Management. Eur Heart J 36(17):1012–1022, pmid:25694464. (5 11, 2001) Structural mechanism for statin inhibition of HMG-CoA reductase. Science 292(5519):1160–1164, pmid:11349148. (6 12, 2007) The role of coenzyme Q10 in statin-associated myopathy: a systematic review. J Am Coll Cardiol 49(23):2231–2237, pmid:17560286. (6, 2004) Atorvastatin decreases the coenzyme Q10 level in the blood of patients at risk for cardiovascular disease and stroke. Arch Neurol 61(6):889–892, pmid:15210526. (3, 1993) Evidence of plasma CoQ10-lowering effect by HMG-CoA reductase inhibitors: a double-blind, placebo-controlled study. J Clin Pharmacol 33(3):226–229, pmid:8463436. (3 15, 2004) Current overview of statin-induced myopathy. Am J Med 116(6):408–416, pmid:15006590. (3 1, 2010) Risk factors and drug interactions predisposing to statin-induced myopathy: implications for risk assessment, prevention and treatment. Drug Saf 33(3):171–187, pmid:20158283, doi: 10.2165/11319380-000000000-00000. (2, 2005) Pitavastatin. Int J Clin Pract 59(2):239–252, pmid:15854203. (8, 1998) Grapefruit juice-drug interactions. Br J Clin Pharmacol 46(2):101–110, pmid:9723817. (9 1, 2006) Rhabdomyolysis associated with pomegranate juice consumption. Am J Cardiol 98(5):705–706, pmid:16923466. (12, 2001) Association of polymorphism in the cytochrome CYP2D6 and the efficacy and tolerability of simvastatin. Clin Pharmacol Ther 70(6):546–551, pmid:11753271. (6, 2010) The genetics of statin-induced myopathy. Atherosclerosis 210(2):337–343, pmid:20042189, doi: 10.1016/j.atherosclerosis.2009.11.033. (May-Jun 2014) The National Lipid Association's Muscle Safety Expert Panel. An assessment by the Statin Muscle Safety Task Force: 2014 update. J Clin Lipidol 8(3 Suppl):S58–S71, pmid:24793443, doi: 10.1016/j.jacl.2014.03.004. (9, 2006) Statin therapy induces ultrastructural damage in skeletal muscle in patients without myalgia. J Pathol 210(1):94–102, pmid:16799920. (2006) Effect of ezetimibe and/or simvastatin on coenzyme Q10 levels in plasma: a randomised trial. Drug Saf 29(8):703–712, pmid:16872244. (1, 2015) Lipid and Blood Pressure Meta-analysis Collaboration Group. Effects of coenzyme Q10 on statin-induced myopathy: a meta-analysis of randomized controlled trials. Mayo Clin Proc 90(1):24–34, pmid:25440725, doi: 10.1016/j.mayocp.2014.08.021. (2, 2015) A randomized trial of coenzyme Q10 in patients with confirmed statin myopathy. Atherosclerosis 238(2):329–335, pmid:25545331, doi: 10.1016/j.atherosclerosis.2014.12.016. (3, 2011) The relationship of vitamin D deficiency to statin myopathy. Atherosclerosis 215(1):23–29, pmid:21185021, doi: 10.1016/j.atherosclerosis.2010.11.039. (5, 2002) Rho GTPase signalling pathways in the morphological changes associated with apoptosis. Cell Death Differ 9(5):493–504, pmid:11973608. (12, 2005) Changes in ubiquitin proteasome pathway gene expression in skeletal muscle with exercise and statins. Arterioscler Thromb Vasc Biol 25(12):2560–2566, pmid:16224050. (7, 2005) Low density lipoprotein non-esterified fatty acids and lipoprotein lipase in diabetes. Atherosclerosis 181(1):109–114, pmid:15939061. (7, 2005) High-dose statins and skeletal muscle metabolism in humans: a randomized, controlled trial. Clin Pharmacol Ther 78(1):60–68, pmid:16003294. (10, 2010) Statin-associated myopathy and its exacerbation with exercise. Muscle Nerve 42(4):469–479, pmid:20878737, doi: 10.1002/mus.21817. (6 16, 2009) Narrative review: statin-related myopathy. Ann Intern Med 150(12):858–868, pmid:19528564. (11, 1995) Human aging, muscle mass, and fiber type composition. J Gerontol A Biol Sci Med Sci, 50 Spec No:11-16. (2 1, 2007) Safety and efficacy of statins in Asians. Am J Cardiol 99(3):410–414, pmid:17261409. (2, 2005) A literature search on pharmacokinetic drug interactions of statins and analysis of how such interactions are reflected in package inserts in Japan. J Clin Pharm Ther 30(1):21–37, pmid:15659001. (8, 2006) Genetic risk factors associated with lipid-lowering drug-induced myopathies. Muscle Nerve 34(2):153–162, pmid:16671104. (1, 2010) Transporter pharmacogenetics and statin toxicity. Clin Pharmacol Ther 87(1):130–133, pmid:19890253, doi: 10.1038/clpt.2009.197. (10 20, 2009) The SLCO1B1*5 genetic variant is associated with statin-induced side effects. J Am Coll Cardiol 54(17):1609–1616, pmid:19833260, doi: 10.1016/j.jacc.2009.04.053. (10, 2007) Mitochondrial disorders. Curr Opin Neurol 20(5):564–571, pmid:17885446. (3, 2007) Prenyldiphosphate synthase, subunit 1 (PDSS1) and OH-benzoate polyprenyltransferase (COQ2) mutations in ubiquinone deficiency and oxidative phosphorylation disorders. J Clin Invest 117(3):765–772, pmid:17332895. 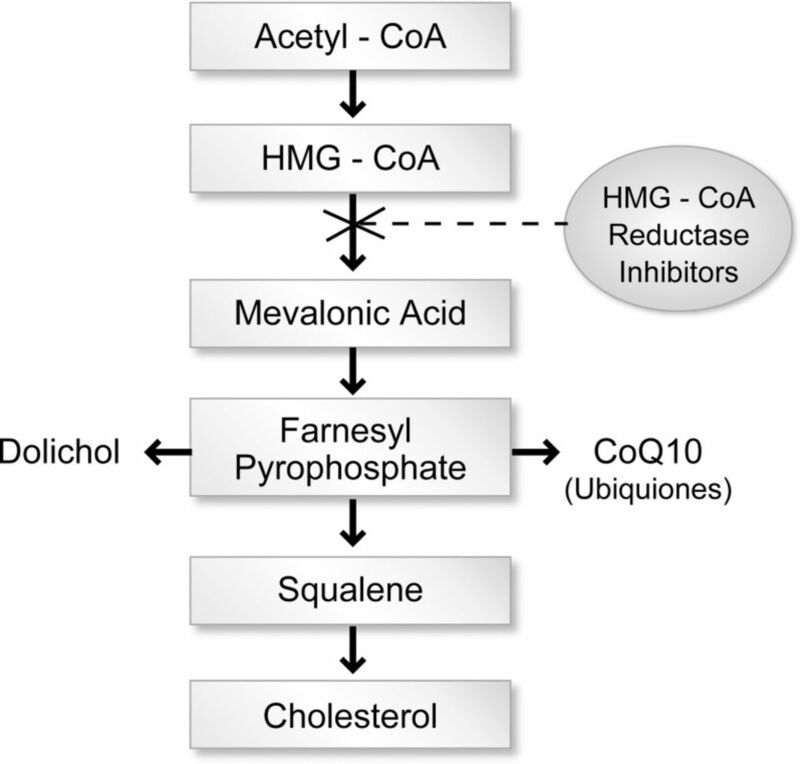 (3, 2012) Haploinsufficiency of COQ4 causes coenzyme Q10 deficiency. J Med Genet 49(3):187–191, pmid:22368301, doi: 10.1136/jmedgenet-2011-100394. (12, 2006) Leigh syndrome with nephropathy and CoQ10 deficiency due to decaprenyl diphosphate synthase subunit 2 (PDSS2) mutations. Am J Hum Genet 79(6):1125–1129, pmid:17186472. (10, 2011) Mechanisms of statin-induced myalgia assessed by physiogenomic associations. Atherosclerosis 218(2):451–456, pmid:21868014, doi: 10.1016/j.atherosclerosis.2011.07.007. (11 26, 2013) Vitamin D and cardiovascular health. Circulation 128(22):2404–2406, pmid:24276875, doi: 10.1161/CIRCULATIONAHA.113.002902. (7, 2009) Vitamin D insufficiency—a novel mechanism of statin-induced myalgia? Clin Endocrinol (Oxf) 71(1):154–155, pmid:19178510, doi: 10.1111/j.1365-2265.2008.03448.x. (8 31, 2002) Statins, fibrates, and ocular myasthenia. Lancet 360(9334):717, pmid:12241896. (12 14, 2004) Statin-associated exacerbation of myasthenia gravis. Neurology 63(11):2188, pmid:15596782. (7, 2004) McArdle's disease diagnosed following statin-induced myositis. Ann Clin Biochem 41(Pt 4):338–340, pmid:15298748. (7 27, 2004) Evidence for defective energy homeostasis in amyotrophic lateral sclerosis: benefit of a high-energy diet in a transgenic mouse model. Proc Natl Acad Sci U S A 101(30):11159–11164, pmid:15263088. (1 1, 2013) Effect of statins on skeletal muscle function. Circulation 127(1):96–103, pmid:23183941, doi: 10.1161/CIRCULATIONAHA.112.136101. (10, 2012) Effect of statins on skeletal muscle: exercise, myopathy, and muscle outcomes. Exerc Sport Sci Rev 40(4):188–194, pmid:23000957, Erratum in: Exerc Sport Sci Rev. 2013 Jan;41(1):71. (12 1, 2004) Incidence of hospitalized rhabdomyolysis in patients treated with lipid-lowering drugs. JAMA 292(21):2585–2590, pmid:15572716. (6, 2010) Statin-associated muscle-related adverse effects: a case series of 354 patients. Pharmacotherapy 30(6):541–553, pmid:20500044, doi: 10.1592/phco.30.6.541. (8 13, 2012) Effects of statins on energy and fatigue with exertion: results from a randomized controlled trial. Arch Intern Med 172(15):1180–1182, pmid:22688574, doi: 10.1001/archinternmed.2012.2171. (7 22, 2013) Statins and musculoskeletal conditions, arthropathies, and injuries. JAMA Intern Med 173(14):1–10, pmid:23877079, doi: 10.1001/jamainternmed.2013.6184. Erratum in: JAMA Intern Med. 2013 Aug 12;173(15):1477. (8, 2010) The effects of statins on skeletal muscle strength and exercise performance. Curr Opin Lipidol 21(4):324–328, pmid:20581676, doi: 10.1097/MOL.0b013e32833c1edf. (9, 2009) Statin therapy, muscle function and falls risk in community-dwelling older adults. QJM 102(9):625–633, pmid:19633029, doi: 10.1093/qjmed/hcp093. (2013) Physical activity, cardiorespiratory fitness, and exercise training in primary and secondary coronary prevention. Circ J 77(2):281–292, pmid:23328449. (12, 2013) Physical activity promotion in the health care system. Mayo Clin Proc 88(12):1446–1461, pmid:24290119, doi: 10.1016/j.mayocp.2013.08.020. (4, 2009) Healthy hearts—and the universal benefits of being physically active: physical activity and health. Ann Epidemiol 19(4):253–256, pmid:19344864, doi: 10.1016/j.annepidem.2009.01.019. (2013) Statins for the primary prevention of cardiovascular disease. Cochrane Database Syst Rev, Jan 31;1:CD004816. doi: 10.1002/14651858.CD004816.pub5. (8 11, 2012) The effects of lowering LDL cholesterol with statin therapy in people at low risk of vascular disease: meta-analysis of individual data from 27 randomised trials. Lancet 380(9841):581–590, pmid:22607822, doi: 10.1016/S0140-6736(12)60367-5. et al. (2 2, 2013) Interactive effects of fitness and statin treatment on mortality risk in veterans with dyslipidaemia: a cohort study. Lancet 381(9864):394–399, pmid:23199849, doi: 10.1016/S0140-6736(12)61426-3. (8, 2008) Exercise and cardiovascular risk reduction: time to update the rationale for exercise? J Appl Physiol (1985) 105(2):766–768, pmid:18174390, doi: 10.1152/japplphysiol.01028.2007. (11 20, 2008) JUPITER Study Group. Rosuvastatin to prevent vascular events in men and women with elevated C-reactive protein. N Engl J Med 359(21):2195–2207, pmid:18997196, doi: 10.1056/NEJMoa0807646. (8 15, 1996) Prognostic significance of plasma norepinephrine in patients with asymptomatic left ventricular dysfunction. SOLVD Investigators. Circulation 94(4):690–697, pmid:8772689. (2 20, 2002) Sympathetic activation markedly reduces endothelium-dependent, flow-mediated vasodilation. J Am Coll Cardiol 39(4):683–688, pmid:11849869. (12, 2005) Mild to moderate muscular symptoms with high-dosage statin therapy in hyperlipidemic patients—the PRIMO study. Cardiovasc Drugs Ther 19(6):403–414, pmid:16453090. (6, 2012) Potential adverse cardiovascular effects from excessive endurance exercise. Mayo Clin Proc 87(6):587–595, pmid:22677079, doi: 10.1016/j.mayocp.2012.04.005. Erratum in: Mayo Clin Proc. 2012 Jul;87(7):704. (4, 2013) The dose of running that best confers longevity. Heart 99(8):588–590, pmid:23512971, doi: 10.1136/heartjnl-2013-303683. (4, 2013) Run for your life ... at a comfortable speed and not too far. Heart 99(8):516–519, pmid:23197444, doi: 10.1136/heartjnl-2012-302886. (10, 1995) Differential sensitivity of C2-C12 striated muscle cells to lovastatin and pravastatin. J Mol Cell Cardiol 27(10):2397–2402, pmid:8576954. (1, 1998) Hydrophilicity/lipophilicity: relevance for the pharmacology and clinical effects of HMG-CoA reductase inhibitors. Trends Pharmacol Sci 19(1):26–37, pmid:9509899. (6, 1996) Differential effects of 3-hydroxy-3-methylglutaryl-coenzyme A reductase inhibitors on the development of myopathy in young rats. Pediatr Res 39(6):1028–1035, pmid:8725265. (9, 1998) Myopathy induced by HMG-CoA reductase inhibitors in rabbits: a pathological, electrophysiological, and biochemical study. Toxicol Appl Pharmacol 152(1):99–106, pmid:9772205. (3, 1995) In vitro myotoxicity of the 3-hydroxy-3-methylglutaryl coenzyme A reductase inhibitors, pravastatin, lovastatin, and simvastatin, using neonatal rat skeletal myocytes. Toxicol Appl Pharmacol 131(1):163–174, pmid:7878672. (8, 2009) Alternate day dosing of rosuvastatin: potential usefulness in statin-intolerant patients. Can J Cardiol 25(8):453, pmid:19678415. (4 2, 2013) Discontinuation of statins in routine care settings: a cohort study. Ann Intern Med 158(7):526–534, pmid:23546564, doi: 10.7326/0003-4819-158-7-201304020-00004. (11 1, 2007) Effect of coenzyme Q(10) supplementation on simvastatin-induced myalgia. Am J Cardiol 100(9):1400–1403, pmid:17950797. (8, 2012) Coenzyme Q10 reverses mitochondrial dysfunction in atorvastatin-treated mice and increases exercise endurance. J Appl Physiol (1985) 113(3):479–486, pmid:22653988, doi: 10.1152/japplphysiol.01362.2011. (4, 2008) Antifatigue effects of coenzyme Q10 during physical fatigue. Nutrition 24(4):293–299, pmid:18272335, doi: 10.1016/j.nut.2007.12.007. Erratum in: Nutrition. 2008 Jun;24(6):616. (1997) The effect of coenzyme Q10 on the exercise performance of cross-country skiers. Mol Aspects Med 18(Suppl):S283–S290, pmid:9266538. (10, 2008) Reducing exercise-induced muscular injury in kendo athletes with supplementation of coenzyme Q10. Br J Nutr 100(4):903–909, pmid:18284711, doi: 10.1017/S0007114508926544. (5 15, 2007) Effect of coenzyme q10 on myopathic symptoms in patients treated with statins. Am J Cardiol 99(10):1409–1412, pmid:17493470. (10, 2010) Mitochondrial myopathies: developments in treatment. Curr Opin Neurol 23(5):459–465, pmid:20651591, doi: 10.1097/WCO.0b013e32833d1096. (11, 2010) A randomized trial of coenzyme Q10 in mitochondrial disorders. Muscle Nerve 42(5):739–748, pmid:20886510, doi: 10.1002/mus.21758. (11, 2005) Muscle coenzyme Q10 level in statin-related myopathy. Arch Neurol 62(11):1709–1712, pmid:16286544. (3 4, 2008) Effects of acute and 14-day coenzyme Q10 supplementation on exercise performance in both trained and untrained individuals. J Int Soc Sports Nutr 5:8, pmid:18318910, doi:10.1186/1550-2783-5-8. (2007) Effect of coenzyme Q10 supplementation on exercise-induced muscular injury of rats. Exerc Immunol Rev 13:76–88, pmid:18198662. (8 15, 2012) Effect of coenzyme Q10 supplementation on statin-induced myalgias. Am J Cardiol 110(4):526–529, pmid:22608359, doi: 10.1016/j.amjcard.2012.04.026. (2003) Systematic review of effect of coenzyme Q10 in physical exercise, hypertension and heart failure. Biofactors 18(1-4):91–100, pmid:14695924. (11, 2010) Coenzyme Q(10) and statin myalgia: what is the evidence? Curr Atheroscler Rep 12(6):407–413, pmid:20725809, doi: 10.1007/s11883-010-0134-3. (8, 1996) The effects of 3-hydroxy-3-methylglutaryl-CoA reductase inhibition on tissue levels of carnitine and carnitine acyltransferase activity in the rabbit. Lipids 31(8):867–870, pmid:8869889. (12, 2004) Improvement of statin-associated myotoxicity by L-carnitine. J Thromb Haemost 2(12):2270–2271, pmid:15613049. (10, 2012) CoQ10 and L-carnitine for statin myalgia? Expert Rev Cardiovasc Ther 10(10):1329–1333, pmid:23190071, doi: 10.1586/erc.12.92. (7, 2010) Resolution of statin-induced myalgias by correcting vitamin D deficiency. South Med J 103(7):690–692, pmid:20531048, doi: 10.1097/SMJ.0b013e3181e21088. (9, 2011) A comparison of 25-hydroxyvitamin D serum levels among those with or without statin-associated myalgias. Atherosclerosis 218(1):247–249, pmid:21616490, doi: 10.1016/j.atherosclerosis.2011.04.037. (7, 2012) Muscle pain and serum creatine kinase are not associated with low serum 25(OH) vitamin D levels in patients receiving statins. Clin Endocrinol (Oxf) 77(1):36–41, pmid:22211469, doi: 10.1111/j.1365-2265.2011.04321.x.